Striker James Collins is delighted to finally be getting the chance to play upfront alongside Danny Hylton for the Hatters. The pair are starting to hone their relationship at the tip of Luton’s attack, with both on target in the 2-0 win over Accrington on Saturday, making it nine goals in 10 games together now. Collins, who has bagged seven goals himself after joining from Crawley in the summer, said: “I love playing with Danny. “I played against him for years and now I’ve got a chance to play with him and me, him and Harry (Cornick) have got the shirts at the minute. “We enjoy playing with each other and we are all friends off the pitch as well, which always helps and long may this run continue. “We work hard together in training, always doing finishing, always practising penalties together, always working on our movement. “Me and Danny are quite similar, we like to work hard and like to over-think things . 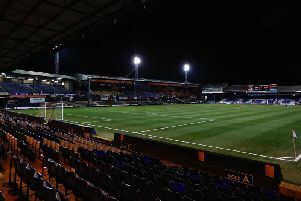 Luton have been using a front three in recent matches too with Cornick deployed alongside Hylton and Collins, as the ex Shrewsbury and Northampton forward has been impressed with just how it has been working. He added: “We’ve been unfortunate with injuries and suspensions, so I don’t know if it was forced on the gaffer, but it seems to be an unbelievable change as I don’t think we’ve lost since he’s changed it. “I think we look a threat, I don’t know what it looks like from the outside, but on the pitch it feels to me like us three are a threat.